Considering that he has spent much of his career to date making worthy literary adaptations like Pride and Prejudice and Atonement, it came as something of a surprise when director Joe Wright would direct a stylish thriller about a young girl (Saoirse Ronan) who is raised by her father (Eric Bana) to be a perfect killing machine. What's even more surprising is that not only is Hanna a great genre film, it's also probably Wright's best work to date. From the film's stark opening, in which Ronan is shown tracking and killing a deer, through to its theme park-set, blood soaked finale, Hanna rarely lets up. 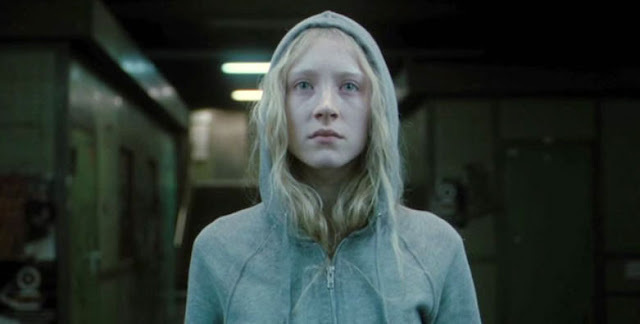 Driven by The Chemical Brothers' propulsive score, the first and third acts of the film barrel along at breakneck speed as it moves across continents, tracking Hanna's journey from her home in the Finnish wilderness to Europe, via Morocco, as she goes in search of CIA agent Marissa Wiegler (Cate Blanchett), who is in turn hunting Hanna's father. During these sections of the story, the film consists of one exhilarating chase sequence after another, with Ronan and Wright rising to the challenge by delivering action set pieces that are thrilling and painful. There's a crunching physicality to the film that is refreshingly brutal considering how glossy the film looks, and this gives each chase an added sense of peril. It also helps that Saoirse Ronan is a phenomenal young actress who anchors the film beautifully. As a girl who has been raised only to kill and to survive, she brings an unnerving detached quality to the role that makes her eerily convincing as a teenage killer. Yet Hanna is still a child, and there is a vulnerability to her that no amount of hardness can overcome. The disparity creates a nice tension that the film plays on in its story, which has a fairytale quality to it that suits the creepy, heightened tone that Wright and his writers David Farr and Seth Lochhead create, especially during the scenes in which a German hired gun (played to campy perfection by Tom Hollander) and his cronies chase Hanna through various locales, including a campsite, a subway station and a loading dock. Ronan also grounds the film during its middle section, when the action lets up as, following an escape from the CIA, Hanna meets a very middle-class family headed up by Jason Flemyng and Olivia Williams. The family take her in, in the process exposing her to children her own age for the first time in her life, as well as concepts live 'fun' and 'kissing'. It's a bold move to stop a previously relentless action movie in order to explore the effects of her upbringing on the main character, particularly how being trained to kill has stunted her emotional growth, but there's an intoxicating sense of adventure to these scenes. Through Hanna, we experience everyday things as if they are wholly new, and watching her try to understand new devices and concepts adds a sense of discovery and fun that makes for a welcome change from the pounding chases. It seems that Joe Wright is returning to his standard fare with his next film, a new adaptation of Tolstoy's Anna Karenina, and whilst I am excited to see what he does next, it's disappointing that he won't try his hand at a genre piece again for a while, because his first attempt is a pretty wonderful effort. Exciting, thoughtful and flawlessly performed, Hanna is one of the most intense and idiosyncratic action films of the year. Extras: Commentary by Joe Wright; alternate ending; deleted scenes; and a selection of fun making of documentaries.